Emilie Shapiro’s Peru-inspired earrings represent a seamless marriage of materials. Traveling straight to Peru was never simpler. Inspired by views of the sunrise over Lake Titicaca, jewelry designer Emilie Shapiro crafts each pair of her stunning earrings using a wax model that holds stones in place while molten metal flows in and surrounds them. 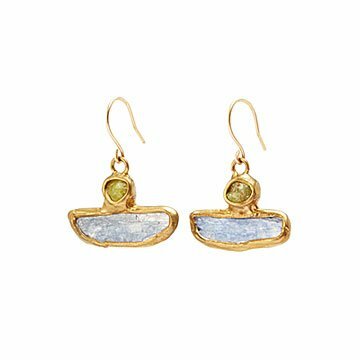 The result is a seamless marriage of materials: striking blue kyanite and green garnet embedded in waves of 100% recycled, nickel-free brass. Handmade in New York. 1" L x .7" W Full Drop 1.1"
Soak in warm water with mild soap. Gently scrub with a soft brush.